Nick Catone is a professional MMA martial arts fighter, and his wife, Marjorie Catone, is a registered nurse who works in an intensive care unit at a local hospital where they live. 17 days after their 20 month old healthy and active son, Nicholas, was vaccinated with the DTaP (Diphtheria, Tetanus, Pertussis) vaccine, his parents found him dead in his bed one morning. In an interview with Del Bigtree, Marjorie comments about how her nursing education never trained her in the possible adverse reactions to vaccines, and she never bothered to check the ingredients of the vaccine, even though as a wife of a professional MMA fighter and mother she was meticulous to check ingredient lists of foods to make sure her family was eating healthy. The autopsy report of their son listed the cause of death as "sudden unexplained" (SIDS) and "natural," as medical authorities apparently refused to consider their son's vaccines as a contributing factor to his death, and they allegedly did not conduct a thorough exam during the autopsy. Nick and Marjorie now want to warn others about the dangers of vaccines, so that parents can be informed before making a decision to vaccinate their children, before it is too late and they find themselves in the same situation as they are, grieving over the death of their formerly healthy child. 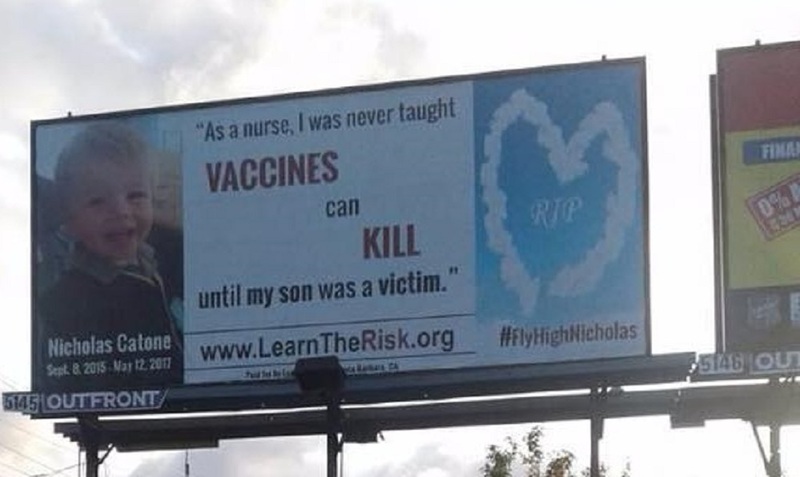 They are putting up billboards in several states in an effort to educate the public on the risks of vaccines. I applaud their efforts to wake up the medically brainwashed masses to the oldest scam in the Rx bag. Slowly, the world is learning that it is malnutrition and lack of sanitation that causes almost all health problems and not micro organisms. My heart goes out to his couple and the thousands of others who've also lost their precious children to this satanic medical ritual.